It doesn?t normally require any modification to the supply but the hard part is figuring out how to trick them into turning on. Far and away the best way is to find someone who has already done it. I have put down a few references I know about and welcome additions. This is about SERVER supplies which often have large 12V capacity and not much else; it is NOT about converting normal PC power supplies. (The ?ground the green wire and add a load resistor? stuff). That is covered extensively elsewhere. UPDATE There are now available supplies for PCs that have substantial 12V rails and large (850-1200 Watt) capacity that work without any electrical conversion. If you have used one of these, suggest you start a separate thread. IF YOU HAVE AN OPINION OR JUST WANT TO COMMENT OR HAVE A QUESTION ABOUT CONVERTING A PARTICULAR SUPPLY please do it?in the forums. Bottom Line: If you have an unknown supply you need help with, try a post in the original 12v 100A supply thread (link 2 below) which seems to have a good range of posters – or start a new one with a specific title that includes your question. That thread now has some good info on how to solve an unknown supply as well. See the first few posts. When/if you ever get it to work, then post the link to that info here to make it easier for others to find. If you have an unknown supply and can’t find the information from someone who has already solved it then this post contains the best information/links on how to establish which pins might turn it on and control the output voltage. Various threads containing information on converting different supplies. This DELL PSU is still eluding me on the switch on connections to make it work, which is annoying as I have a dozen of them! Computer power supply units (PSU) output large currents at +12V, +5V, +3.3V and smaller currents at bias voltages -12V and, formerly, at -5V. They are small, readily available, and inexpensive compared to laboratory supplies. Obsolete versions are still very useful as power supplies, and can be obtained at very low cost. The one I adapted as a laboratory supply here cost only $10, but it supplies +5V at 32A, +3.3V at 24A, and +12V at 6A, in addition to -5V and -12V at 300 mA. Computer power supplies were designed for that purpose, not as a laboratory supply, so if we use them for this purpose, we must be sure to provide a proper environment. They are switching supplies, which always demand a minimum current output. In a computer, this load is always connected, but in a laboratory supply it is not, and we must provide it. Some switching power supplies (especially those intended for laboratory use) have an internal load. 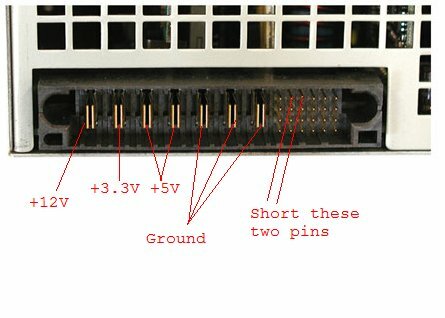 A computer PSU cannot be assumed to look into an open circuit, unless you have the correct specifications, and they say so. A modern ATX supply has minimum loads of about 1A on the +12 supples, 0.3A on the +5V, and 0.5A on the +3.3V. The -12V and the +5V standby ouput have no minimum current. These figures can be used as a general guide if the exact specifications are unknown. I used 12Ω, 3W sand power resistors in parallel as a load for +5V and +3.3V, which gives currents of 0.83A and 0.55A. These currents will not be missed. For +12V, I used a 20Ω, 10W sand power resistor, which gives a current of 0.60A. These resistors were soldered to 7-terminal tie point strips (also available from All). The power dissipation is less than the ratings, but the heat will be present, so the resistors should be supported in the air and not touching anything. My PSU is a Teapo TP-511B-4, from All Electronics, made in Sep. 1994 (before the ATX specifications). 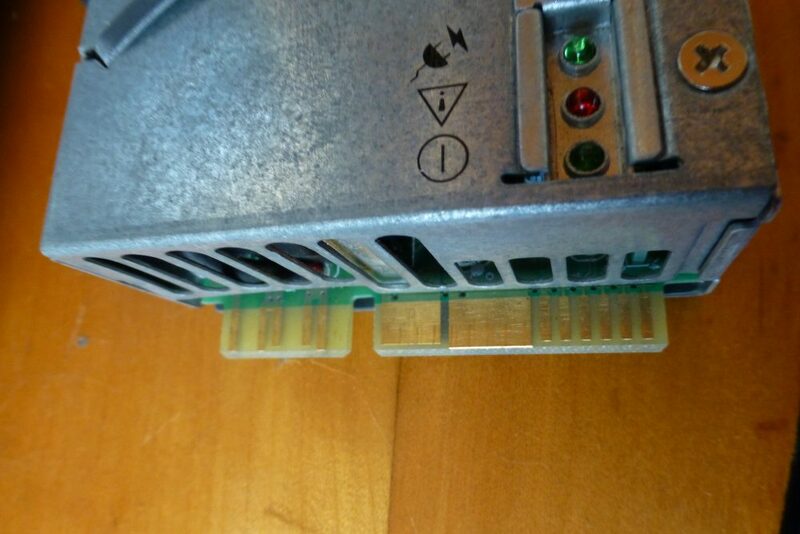 The power supply came with a main output connected to a 16-pin plug, a drive ouput to two large (HDD and CD) 4-pin connectors, and a drive output to one large, and one small (floppy) connectors. The wire colors were similar to those used in ATX supplies, but not completely. The five black wires were ground (earth), and the four red wires were assumed to be +5V. Three wires of a dark color, perhaps grey, indicated a high-current output, since the current maximum on one wire is generally about 8A. This could only be the +3.3V. The black wires, red wires and grey wires showed zero resistance between each wire of a group, so we can assume that each color of wires is equivalent. A red wire and a grey wire were used to connect with the load resistors, as well as black wires for earths. This left only four wires. The yellow wire was probably +12V, as yellow is generally used for this voltage. It was connected to one end of a 20Ω bleeder resistor, with a black wire on the other terminal. The blue and white wires were then the bias supplies; one was -5V, the other -12V. We can wait until the supply is tested to find out which. The remaining wire, orange, could well be a Power Good signal. This color is used in the ATX standard for 3.3V, but apparently not here. Three red wires, two black wires, two grey wires, and the four remaining wires, were brought to a 12-position “Eurostyle” terminal strip. I used the smallest strip (7 Amp), but if I had it to do over, I would use the next larger size, 20 Amp, as more suitable for the large wires. Everything was mounted on a 14″ length of good-quality 1 x 10 board. This makes an excellent breadboard, and can be finished attractively if you prefer. The PSU rested inside 6 small corner braces, the ones with one hole in each leg. 4 braces at the corners located the PSU, and a brace on each end kept it from moving sideways. I did not dare to drill and tap holes in the PSU for attaching it to 4 braces, not knowing what I would hit inside. The PSU is free to be lifted out. Wire over the top could be used to hold it down, but I did not think this was necessary. AC power is supplied through an IEC (SPH-386) detachable power cord. Be sure the voltage selector is set to 115V (or whatever your voltage is!). A push-on, push-off switch at the end of a cable coming out of the supply turns it on and off. When the PSU was turned on, there was no smoke or noise. The DMM verified the voltages on the several wires, which were as expected. The blue wire was -12V, the white wire -5V. The orange wire showed 3.3V, so it is probably the PGood signal. The actual voltages were 5.17, 3.31, 12.19, -4.99 and -11.98, and they were steady. I did not do a load test. The supply draws a maximum of 8A from the 115V line. Adding up all the maximum power outputs, one gets 319.5W, though the supply is rated at 222W. In laboratory use, however, the load will never approach these values. Modern ATX supplies have a 24-pin main output connector (previously 20-pin). Pin 16, a green wire, is grounded to turn the supply on. Pin 8, a grey wire, is the PWR_OK signal. The 3.3V is on orange wires. Pin 13, an orange wire, is used to sense the 3.3V at the point of use so it can be regulated to the proper value. The purple wire at Pin 9 supplies the standby +5, which is always on. No load resistor is necessary for it. The tendency in ATX power supplies is to increase the output at +12V (there are even two independent sources, each of which requires a minimum load) and decrease the load at +5V. The -5V bias supply is also disappearing, since newer chips do not require it. For excellent information on ATX power supples, including pinouts and use, see http://www.playtool.com/pages/psuconnectors/connectors.html. Links to power supply specifications (form factors) are included. There is even a section on the subject of this page. My PSU was obtained from All Electronics, www.allelectronics.com. Phone orders at 1-800-826-5432. Cat. # PS-511, $10. All components used here were also available from All. This entry was posted in CB-Radio-Hobby, Electronic Repairs by 43AX05. Bookmark the permalink.